We rarely plan a family activity on Saturdays since Jared has playschool on those days but this Saturday was an exception. We were supposed to go out yesterday to watch the movie, Turbo, but we were not able to do so, so we moved it for today. 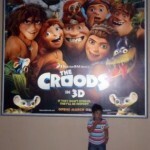 The little man wanted to see this film about snails who race so we trooped to SM Baliwag to finally watch it. The mall was packed with shoppers because of the 3-day sale, but it was a good thing fast foods, as well as parking spaces, are not too cramped that we were able to park promptly and find an available table at McDonald’s in no time. 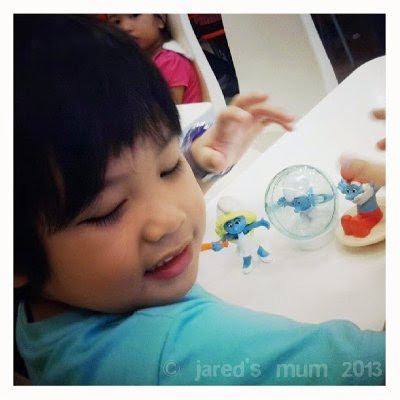 We’d almost always choose Chowking since they have healthier food options and Jared just love their Pancit Canton, but after ordering his usual for takeaway, we headed to McDonald’s so that we can grab him a few Smurfs toys. 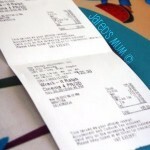 After having our stomachs filled, we headed to buy our movie tickets. It was still an hour or so before the movie started so I whisked my two boys to my favorite shop in the world, the bookstore, to look around. I was planning to buy some craft supply like colored papers and glue, which I shall be using for the little man’s birthday celebration. Of course, I also made sure to get a stash of postcards, while we were there. After paying at the bookstore’s till we proceed to the second-floor cinema. We are just in time as the last screening’s credits are just traversing on the big screen. The little man was all eyes as the movie played on. 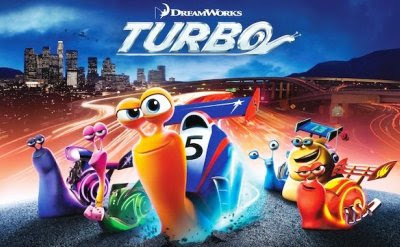 Turbo is all about a small garden snail, Theo, who dreams of becoming a great racer just like his favorite Indianapolis 500 champ, Guy Gagne. His passion for anything that involves speed makes him the odd one out in the usually cautious and slow snail community, and a constant source of disappointment to his brother, Chet. In his constant need for speed, he found himself on the road one night, taking a road trip courtesy aboard the zooming cars! One thing led to another and he landed on a drag racer’s car engine and had his DNA infused with nitrous oxide. The once-dreaming-of-speed snail became a speedster, zooming past everything in his wake. He went back to his snail community to share the good news with them but it all led to a catastrophe with a bike careening into the garden and destroying a big portion of their lazy little community. He was fired from his garden crew duties and was ordered to leave the group because of his never-ending misdemeanors. His brother, Theo, whom he saved from pesky crows, was also fired from the garden. Tito of Dos Bros Tacos found the unsuspecting garden snails and brought them to their lack luster strip mall and got them to race with a gang of other snails, led by Whiplash and his crew Burn, White Shadow, Smoove Move, and Skidmark. Human and snails alike were dazzled by Theo’s unbelievable speed and he instantly gain the respect of his new community. The ever-cautious Chet, meanwhile, was only reeking with disapproval for Theo’s new venture. Meanwhile, Tito thought of one ambitious yet seemingly outrageous idea ~ he will enter his precious snail to the Indianapolis 500 race! Theo, who’ve christened himself, Turbo, was so excited about the idea and cannot wait to give the famed Indiana race track a go! They overcame a number of hurdles before Turbo was finally allowed to run the race. And what do you know, the little snail won, beating 25 seasoned race care drivers, among them his ultimate favorite Guy Gangne and became quite a sensation! But did I say it was not his ultra-speed that won him the race? Oh well, that’s what you have to find out when you go see this film with your little ones. The little man enjoyed the movie. The colorful characters are such eye candies. The upbeat music, some courtesy of the popular rapper, Snoop Dogg, also gave the movie a fun and enjoyable feel. And did I mention that bankable actors and actresses gave life to these diminutive characters? Ryan Reynolds and Samuel L. Jackson were Turbo and Whiplash, while Michelle Rodriguez lent her voice to Paz, the car mechanic. After the movie, we went down to the Hypermarket to do our groceries. Jared’s dad busied himself surveying the wares at the meat/fish section, while I occupied my time looking after our cart and the little man who was too preoccupied playing with his newly-acquired Smurf toys! 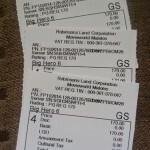 I am glad that the mall was not so packed, we did not even have to endure a long queue just to pay for our purchases. When we got out of the mall, I find the skyline that afternoon quite lovely, so I took a snap of it. 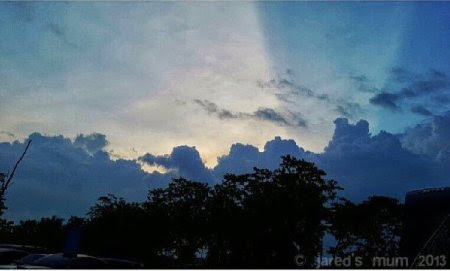 The clear skies mirrored my pleasant mood. Thank heavens for another lovely day spent with my loves!